family frolics: funny tshirt... you had to be there. 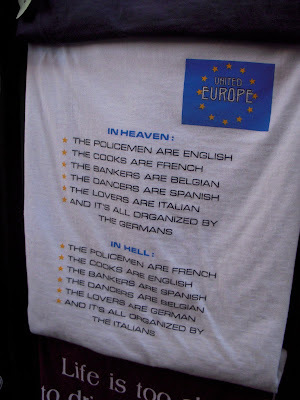 Anthony and I were taking a walk around Florence---and found this t-shirt. Mostly because we cycled across Holland and Belgium, into France. And spent time in England... and now live in Italy... I think we found this shirt particularly hilarious. Stereotypes are stereotypes, and we have experienced quite a few of them recently! This was cause for some great belly-rolling laughter. It's a joy to read your postings! Miss you guys much!! Love ya! OMG that shirt is so on point! I love it and the fact that our kids can actually appreciate the differences amongst all these European cultures. What a great world we live in!